You Can Control Your Physiology / Eating – When it comes to changing your body and managing eating you may think of it as if you are the driver of your car (your body) and will steer and drive it how you want until you get to the final destination. In the real world, it would be better to think of yourself as a surfer on a wave, you need to pick the right wave, stay on it for a while then get off, relax and wait for the next one. If you pick the wrong wave or stay on it too long it will be build up, getting bigger and bigger until it comes crashing down upon you. The expectation that you can just stick to a fat loss plan, forget that the body is hard-wired to fight against periods of lower food intake and then sit back to watch the results come in is crazy. The longer and/or faster you lose fat the more you run into the natural defences of the body against “famine”. This means you will feel hungrier, have more food cravings, experience less energy, have less willpower, feel colder and have an increased binge eating desire. These all build up as your fat loss period continues. This is perfectly normal, completely expected and the surprise is not that is will affect this way, but that you expected it to be any different. The sensible way around this is to ensure fat loss is done at a moderate rate and/or to make use of off weeks / days as guided by the body. This will allow you to ride the response of the body to changes in energy balance. The other side to this coin is stopping all judgements and bad feelings about when you do eat badly or too much during the process. It is probably an expected part of the process. The key is to accept its influence and then plan accordingly. You Can Make Fitness Gains Every Week – Another area I have seen people feeling disappointed is because of their fitness gains being less than they expected. It is another fallacy that you will make fitness improvements every session. Fitness, a little like body transformations, is slow on and slow off. Performance on the other hand can vary greatly from day to day. This means you will get fitter over time but you cannot turn the treadmill on every session expecting to beat your previous performances. The fitter you get this becomes even more true, take a look at professional athletes who could hope to set a PB maybe once every couple of years. The higher the level you reach the less often personal bests happen and slower the gains are made – It is the law of diminishing returns. The sensible way around this is to do your exercise with the focus of enjoying it and doing it to the best of how you feel that day. This will means some days you just get the work done when feeling flat yet on other days when feeling great you may set the world alight. The feelings should be satisfaction in the first scenario as you know it was a tough day to train. Along these lines, the harder any fat loss protocol is (faster the results) the worse your exercise performance becomes in both frequency and magnitude. This should be accounted for when measuring fitness gains. You Will Be In Shape As Quickly As Before – A common mis-expectation is the time it will take to get in shape. In general, people are really bad at judging how long it takes to achieve a goal and frequently this stems from misjudging where their body is when they begin. This is in part caused by how body fat is stored when gaining weight, it is usually hidden on the body either internally or by the whole body increasing in unison so you just are a bigger human being overall. This is often not spotted because relatively the body looks the same. This leads many people to think they can no longer get results like they used to do when younger, The reality is they can lose fat the same way as before except now maybe they need to do it for 8 weeks instead of the usual 2 weeks they used to do. The sensible way around this is using timescales that are realistic to the body and your general lifestyle. You should then feel happy whenever you make progress, you should also be accepting of the fact that the process will take longer overall than it used to take. It Should Be Easy & Fun All The Time – I wrote about this a couple of months ago>>>, Often we have an image that a body transformation should feel like a scene off a rocky film as you run up the steps with the crowd cheering you on while feeling on top of the world. It is a total fallacy that the whole process is easy, fun or always done while feeling good. The reality is that while some days you feel amazing other times it is much less glamorous. These lesser days are about somehow roughly getting through them at the minimum needed levels. You should feel satisfied and proud because despite the challenges on this tough day you battled through and got things done. 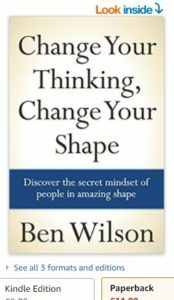 Photo – My Book – Change Your Thinking – Change Your Shape – I discuss mis-expectation and unlearning in numerous chapters. Buy Here (UK) or Here (USA).